A memorable Christmas present for your little one would be tickets to the musical production of Roald Dahl’s James and the Giant Peach. On stage at Toronto’s Young People’s Theatre, this all-ages pleaser is a must-see. Orphaned English boy James (Alessandro Costantini) is sent to live with his aunts, two money-hungry meanies sporting wild hairdos (Nicole Robert and Karen Wood). Fortunately, a magical giant peach begins growing in their backyard, becoming his getaway vehicle. More importantly, the fruit becomes home to him and his new family. James’s new entourage includes maternal Spider (Saccha Dennis), cynical Centipede (Dale Miller), music-making Grasshopper (Stewart Adam McKensy), chic Ladybug (Lana Carillo) and loveable Earthworm (Jacob MacInnis). James and his team of bugs sing and dance their way through a series of adventures such as riding the peach across the Atlantic. Before coming to the show I thought James would have been played by a youngster. Instead, grownup Alessandro Costantini took on the role, and he was perfectly convincing as a sensitive Dover boy, with his British accent, flailing arms, child-like facial expressions, and striped pants. On top of the acting, I liked so many things about this whimsical play. The set was creatively framed by the peel of a giant peach. The music varied from gloomy to silly and upbeat to jazzy, successfully setting the tone. The band performed in plain sight so kids could see their fingers moving. The sounds were evocative, especially when (spoiler alert) we heard the aunts get squashed by the giant peach. Their messy fate brought lots of laughs! And the show started at 7 p.m., not pushing bedtime too late. 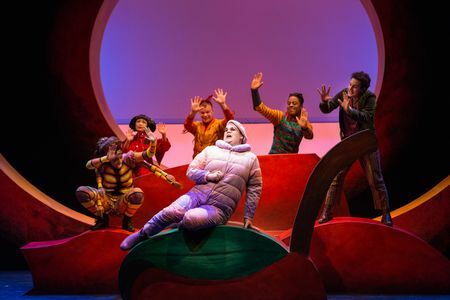 For my young companion and I, the grandest moment in James and the Giant Peach was the “Plump and Juicy” song that centered around Earthworm. Earthworm’s mandate was to act as bait to the seagulls, so that Spider could catch them with her web and have them pull the peach vehicle away and out of danger. The comic choreography had young and old laughing at his conundrum, as we watched Earthworm go from wriggling in fear to boldly taunting the gulls. We left the theatre with smiles on our faces that got even bigger when we stopped to look at the huge inflatable peach on the theatre’s roof. You won’t have any trouble finding this venue. James and the Giant Peach plays at the Young People’s Theatre at 165 Front Street East until January 4, 2015. There are shows every day of the week except Thursdays. They take place either at 11 AM or 2 PM or both. Check calendar. Tickets can be purchased online, in person from Monday to Friday, or by calling 416.862.2222. Check online to see which performances are sold out or almost sold out.